The backlash against globalization still has the power to surprise. Confounding most polls and expert opinions, the United States voted in the presidential candidate promising to build walls, kick out immigrants and otherwise close U.S. borders. The 250-page report includes key takeaways and tools for leaders thinking about globalization strategies for the uncertain future. Europe is followed by North America, with East Asia and the Pacific coming in third. 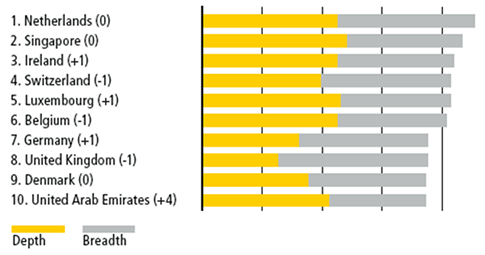 The top 10 are all among the world’s most prosperous countries. The United Arab Emirates is the only one not classified as an “advanced economy” by the International Monetary Fund (IMF). Note that the DHL GCI covers 2005 to 2015, so it does not yet take into account the two big anti-globalization shocks of 2016: The British decision to leave the European Union (known as Brexit) and nationalist candidate Donald Trump winning the U.S. presidential election. But looking at 2005 up through 2015, global connectedness has been growing, especially in its depth (or, intensity). Global connectedness is measured along the lines of four pillars: trade (products and services), investment (capital), information (internet traffic, phone calls, print media) and people (migrants, tourists, students). These four pillars “encompass most of the aspects of international connectedness that have maximum relevance for business people, policymakers, and ordinary citizens concerned with the impact of globalization on their life opportunities,” the authors explain. Globalization and urbanization are two of the key macro-trends shaping our recent past and our future. For the first time, the 2016 report introduces two new city-level indexes — Globalization Hotspots and Globalization Giants — tracking the same four pillars as the country-level indexes. The 113 cities in the ranking are spread across 64 countries and together account for a third of world GDP. Singapore is a perennial on global city lists, but the second-ranked Manama, the modestly sized capital of Bahrain, is a more surprising member of the top 10. “Manama attracted six times as much announced (inward) greenfield FDI [foreign direct investment] relative to its GDP as London and five times as many tourist arrivals per capita (including business travelers) as New York,” the report notes. More than half of Manama’s population are foreign citizens. For example, the authors note that in both the United Kingdom and the United States people think that there are more than twice as many immigrants as there really are (the actual numbers are 13 and 14 percent of U.K. and U.S. populations, respectively). Simply telling people the actual share of immigrants reduces the proportion who think there are “too many” immigrants by between a third and a half, they report. It follows that anti-immigration votes (Brexit, Trump) might have been better challenged if voters were armed with facts. Similarly, people tend to exaggerate and overestimate the impact of global trade, information flows and more. 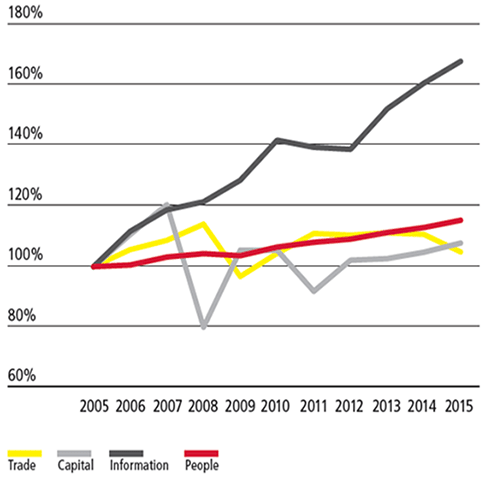 Global trade and information exchanges are significant, but not as extensive as people think. For example, the authors note that more than 70 percent of the average European country’s international trade, capital, information, and people flows take place within Europe itself. And looking at who follows whom on Twitter (information flows): 39 percent of all Twitter ties turn out to be local (as in within the same metropolitan area), 36 percent fall outside the same area but within the same country and 25 percent are international. Facebook traffic is even more locally bound. More specifically, advanced economies are about four times as deeply integrated into international capital flows, five times as much on people flows, and nine times with respect to information flows. Launched just days after Donald Trump’s surprising win, the report hopes to arm policymakers with real information about the actual levels of globalization — which, in sum, are still lower than most people think. 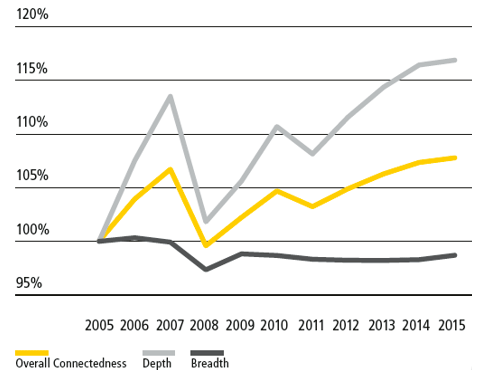 Analyzing more than 1.8 million data points going back to 2005, the Global Connectedness Index measures the depth and breadth of connectedness and tracks trends. The 2016 report ranks 140 countries and territories encompassing 99 percent of the world’s GDP and 95 percent of its population are measured. Trade: covers flows of goods and services. Information: incorporates data on international internet bandwidth, international telephone calls and trade in printed material. People: measures cross-border movements for the long-term (migration), medium-term (university students pursuing degrees abroad) and short-term (tourism). See also: “Two Laws for Global Business” for a summary of the 2016 book The Laws of Globalization and Business Applications.